Perhaps as close to my favorite as it can get without actually being favorite, is Clint Eastwood’s High Plains Drifter, a movie you could describe as “mean” and “weird” and “sexually retrograde” without actually scratching the surface on what’s going on there. In High Plains Drifter, a Stranger (Eastwood) rides into the little mining town of Lago. He’s immediately accosted by a trio of miscreants who have bad intentions on their mind. The stranger isn’t one to stand around and be murdered, though, and kills all three. Turns out the trio of men were hired by the townsfolk to protect them against another trio of men (Geoffrey Lewis, Dan Vadis, and Anthony James) who were hired to kill the previous Sheriff after he discovered the mine was on land the town didn’t own. Only, the town double-crossed those guys and sent them off to prison, and now they want revenge. With no other options, they ask the Stranger to protect them and, while he does that, he also takes his own revenge on them, nearly leveling the town. When he rides away at the end, it is pretty clear the stranger was the spirit of the dead sheriff, who can now rest in peace. In some ways, High Plains Drifter plays in the same sandbox as High Noon, given the cowardly townsfolk in the story protection from vengeful criminals. But in that film they are content to sell out the sherriff to the criminals, provided he’s the only one who dies. But while the two films play in the same sandbox, they build very different castles. High Noon wants to noodle around with the idea of a lone, principled man abandoned by his friends at the moment of truth, letting his struggle stand as an allegory for all sides of the Hollywood blacklist. On the other hand, High Plains Drifter has no real thoughts about politics, or allegory. The biggest message to take from it is, What you reap, so shall you sow. In that vain it presents violence as an ugly thing, and revenge as uglier. And somewhere in all this exists Bad Day At Black Rock, which is not a western in the usual sense, as it takes place in the years just after WWII, and has no horses, or carriages, or six shooters to speak of. Moreover, there isn’t anybody in that iconic duster you’d see Eastwood wear – if folks wear anything, it’s button-down shirts and slacks. 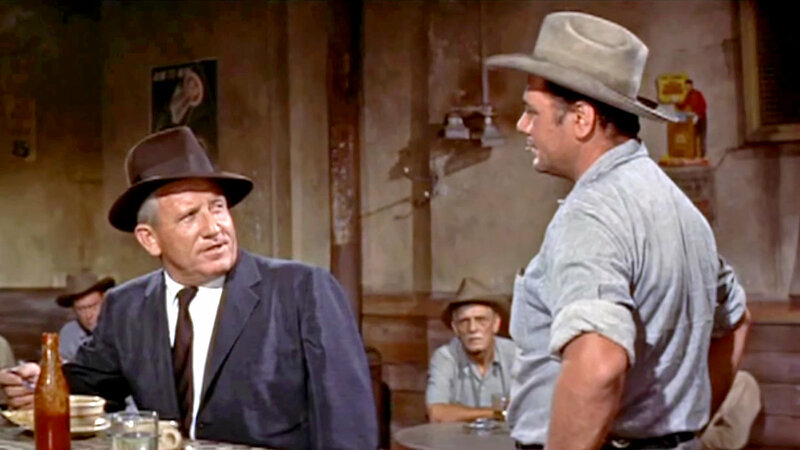 But in terms of setting – Arizona – and mood – it’s very black-hat/white-hat – Bad Day At Black Rock is as western as any of the rest of them. It’s late-1945 when Macreedy (Spencer Tracy) rolls into a dusty, desolate Arizona town on a passenger train that hasn’t stopped there in four years, which instantly rouses suspicion. As soon as Macreedy reveals he’s there looking for a Japanese man, Komoko, who was supposed to have a ranch outside town, Reno Smith (Robert Ryan) and his goons (Lee Marvin and Ernest Borgnine), make it pretty clear they’re going to be killing Macreedy before the day is done. Any why kill him? Well, because they can. But also because Reno rented some useless land to Komoko, thinking he’d really pulled one over on the man. Only, Komoko found water on the land and was making a go of it, which really ground Smith’s gears. The only thing to do? Kill him. And to hide Komoko’s killing they’ll kill Macreedy, too. Only, Macreedy isn’t interested in being killed. John Sturges undoubtedly made some great movies. His The Magnificent Seven is one of the classic ‘Hollywood’ epic westerns, with a score for the ages, and The Great Escape is even more classic than that. But given he was making upwards of four movies a year from 1946 through the mid-1960s, it stands to reason he’d have a couple of outright-great movies. It also stands to reason he’d make a bunch of crap. And it also stands to reason he’d make some films that have a sheen of greatness to them, even as they are completely head-scratching in their finished form. It’s in that third category where Bad Day At Black Rock exists. Here’s the long and short of it – Bad Day at Black Rock has many good pieces, and arranged properly it’d be a scrappy, nasty little noir western. Except, the not-good pieces of it undermine the whole damn thing and make what some think is a classic into an overblown misfire. Specifically, the story makes no sense, and casting Spencer Tracy is beyond lunacy. As to the story, essentially the film is about a man coming out to pay homage to the father of a dead soldier he knew in the war. When he arrives in town, the townspeople go out of their way to be assholes to him, and not helpful, as if that will stop him from going out to the father’s house and finding it burned down. Also, they seem completely baffled when their assholishness raises Macreedy’s suspicion. Why they didn’t just send him to the house, let him see it’s burned down, then say they don’t know where the father went, and watch Tracy leave town, instead of being dickheads and talking about the father being interned with the other Japanese during the war is beyond me. But they didn’t. Moreover, if Reno and his boys were mad enough about Macreedy’s appearance to want to kill him, why do they wait all day to do it? If that’s the outcome, and everybody is on board with it, why not just take care of him in the same way they took car of the dead father? That they don’t is just ridiculous and makes no sense. But characters doing things that make no rational sense is the movie’s stock-in-trade. After all, when Tracy shows up he’s so tight-lipped about why he’s there that he shouldn’t be surprised when everybody is leery of him. And rather than be somewhat honest about his true goal – he wants to meet Komoko because Macreedy served with Komoko’s son in the war, where the son was killed – he says nothing. As if his reason to be there is some sort of secret he has to keep. Bluntly, he plays it like a man who wants a fight and knows how to get it, not one coming to pay a call on a soldier’s father. In sum, the problems of the plot boil down to this – the actions of all parties involved are premised on decisions that need to be made in order to sustain the plot of the film, not on the decisions people would actually make in real life. And if the people in the film acted like folks do in real life, nothing happens. Tracy is either killed quickly, or he is clear why he’s there from the start and is shown what he needs to see and sent away. Aside from the plot and the character’s motivations making no sense, the casting of Tracy is ludicrous. In the first place, the film takes place in 1945, just after the war, and involves one soldier (Tracy), going to pay homage to the father of a soldier her served in the trenches with during the war. The war in both instances being WWII. In other words, a 55 year-old Spencer Tracy was cast to play a man who served in the trenches of the war, a role meant for a man of 30. So, he’s too old – far too old. Age is one thing, but more glaring is Tracy is completely physically wrong for what the movie wants him to be. As viewers, we’re supposed to believe that despite his age and lack-of-agility, Tracy is somehow so physically vital that he can get the better of Ernest Borgnine and Robert Ryan and Lee Marvin, all of whom are young enough to be his children, and all of whom are in the prime of their lives. Under no circumstances would any of them lose a fight to Tracy. Yet, they do. And when they do lose to Tracy, it’s so obvious they’re taking dives because the script requires them to be beaten that the movie becomes outright laughable. Which is all too bad, because Ryan, Marvin and Borgnine are some of the cinemas greatest heavies and here they’re not only wasted, but criminally misused. Still, unsatisfying as it might be, Bad Day at Black Rock is only 82 minutes long, so it’s not like you’ll waste too much time on it. Plus, by the time you realize how unsatisfying the movie is, it’ll already be over. Yet, in one respect the film resonates fully today. The killing of the Japanese guy is so obviously motivated by anti-immigrant sentiment, and Ryan is so good spewing that sort of thing, that you can easily see him as a man ripped from today’s headlines. The only difference is if he existed today he’d wear a Make America Great Again hat and screaming at Trump rallies, whereas back in 1945, he doesn’t. In today’s day and age it wouldn’t be difficult to read an anti-immigrant bias, and MAGA leanings, into what they do. There’s also something to be said about how the film handles the women characters, treating one like an outright whore who wants to be raped.